On the island of Samos, people are burning wood to keep warm whilst still sleeping in tents overnight. 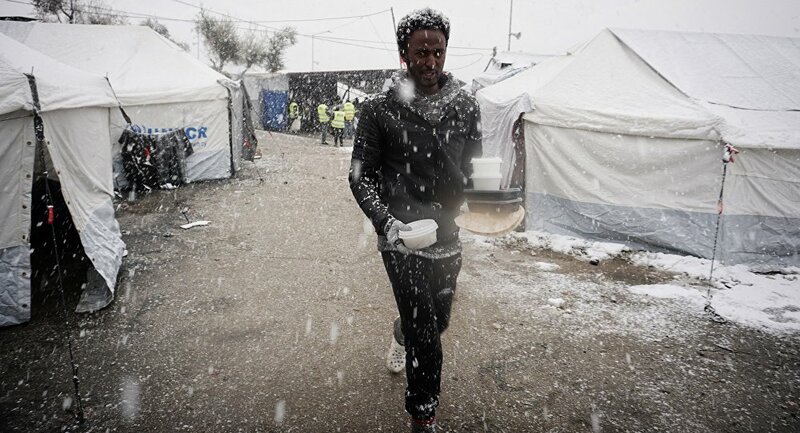 ​Conditions equally harsh and equally as shocking are reported on social media from camps elsewhere in Greece, including the islands of Thessaloniki and Chios. ​Despite Greek migration minister Yiannis Mouzalas reportedly stating that no refugees or migrants were living in the cold. And as the number of migrants at reception centers soars above capacity, the blame is laid on Greece, not the wider European Union community for not properly processing the refugees and providing adequate conditions for them to live in. ​However a succinct EU refugee policy is yet to be agreed among member states, with many countries steadfastly refusing to take in significant numbers of refugees. ​As temperatures in Hungary and Serbia plummet to minus 20 degrees Celsius at night, 2,000 asylum seekers and migrants are still sleeping rough in Belgrade. According to reports from Human Rights Watch (HRW), the Serbian government banned aid organizations from assisting refugees sleeping rough. ​Around 1,000 people are stuck in abandoned warehouses behind Belgrade's railway station, without heating, toilets or showers. ​"They burn whatever scrap they find to keep warm, inhaling poisonous fumes," Lydia Gall, HRW researcher writes. "The EU, its member countries and those who want to join it — like Serbia — have a duty to ensure humane treatment for asylum seekers or migrants. Winterized accommodations are essential." Austrian defense minister Hans Peter Doskozil has accused Brussels of being detached from reality in its handling of the refugee crisis. Brussels has also been accused of outsourcing the refugee crisis by striking a deal with Turkey, where Ankara takes back migrants from Greece and the EU resettles Syrian refugees from Turkey. According to the EC, Greece has been told to improve the situation for refugees and asylum seekers who remain stranded on its islands this winter.